er, it’s more than just mowing your lawn. A considerable amount of care goes into your lawn, far more than simply keeping it trim. 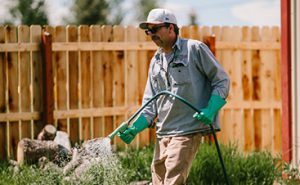 Here are some of the reasons why you need to take advantage of professional lawn care services in Wyoming. Who doesn’t love coming home to a beautiful, stress-free, lawn? Between the mowing, trimming, fertilizing and proper watering that can be a lot to manage when you have a busy life. Ensure your lawn is beautiful – and maintenance-free for you! – when you hire professionals who specialize in the services that Cedar Mountain offers. ent soil pH level or different levels of rainfall based on the kind of coverage you have from trees. Due to this, it’s important to receive the correct fertilizer for the needs of your lawn. You’ll also need to establish the right watering schedule as well. These (as well as other) elements are not one-size-fits-all. It varies, which is why you need a professional lawn care service capable of delivering these lawn care specifics for your property. al additions to your lawn. Beyond just saving on products though, you’ll actually save money in general. Now, if you didn’t care about your lawn and just mowed it to keep the grass short that’s one thing. However, if you care about how your lawn looks, that takes a sizable monetary investment. Trying to buy the right fertilizer and adjust it to meet the needs of your grass is expensive. You’ll also need to pay for lawn mower maintenance, which is another expense that can sneak up on you. In the long run, you’ll save on the products you use, the maintenance, and you’ll avoid the costly experimentation. So if you’re serious about maintaining and perfecting the look of your lawn, you need to use lawn care professionals. When you mow the yard you set it at a certain height and then mow the lawn maybe once or twice a week. This may not be best for what your lawn needs. There are different factors involved and some areas of your lawn may actually require even more fine tuning. The frequency and height of your cut grass plays an important role in the health of the lawn. With a lawn care service provider, you’ll have your lawn cared for as needed. If your concern is patchy grass, weeds, grubs, or other pests, Cedar Mountain can help. We’ve got safe and effective solutions for all of these issues and more. After our professionals treat your lawn, you can sit back and (literally) watch the grass grow. All of our lawn care applications are tested and applied by trained professionals and we stand behind our results. Go ahead, ask your neighbors and I’m sure you’ll hear that Cedar Mountain is their preferred lawn care company across southern and western Wyoming. You have a busy life. From running around with the kids to taking care of your own personal and social life, you may just not have the kind of time needed to care for your lawn. Mowing, fertilizing, planting new seed and watering the property takes time, and this may be time you simply don’t have. So why not let a professional handle this? You’ll have hours put back into your week which you can use on other tasks important to you. No matter the size of your lawn, it’s important to take care of it. Proper lawn care doesn’t just improve your curb appeal, it increases the value of your property as well. However, there’s so much more to proper lawn care than just mowing it. By taking advantage of professional lawn care services, you’ll see an impressive improvement in the quality of your lawn. Cedar Mountain Tree and Lawn Care is your Top Rated Local® Tree and Lawn Care company in south-central Wyoming – now including Casper and Jackson! If you’re tired of spending your weekends trying to keep your lawn nice and healthy, it may be time to call a reputable lawn expert that you know you can trust. We have over 30 years of experience working with homeowners and business owners in the area. If you have any questions or you’re ready to get started, contact us today.